You are here: Home → Symposia → What are the strategic challenges behind the implementation of accountability in education policies? What are the strategic challenges behind the implementation of accountability in education policies? Projects to modernize education are developed on both sides of the Atlantic. Both are governed by accountability. However equality remains a major concern but how this issue is raised varies – the USA does not share EC’s trust in lifelong learning; the issues of migration and governance of difference are addressed from different traditions. Confronting these two models is useful to society’s reflection and policy-making as well. This seminar unites Université Lumière Lyon2; INRP (Institut national de recherche pédagogique), the French institute for research in education; and the ENS-LSH (École nationale supérieure – Lettres et Sciences humaines), the prestigious institution for teaching and research in the humanities and social sciences. It will be held in the Lyon Gerland campus, the perfect venue for an international meeting. 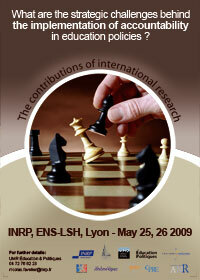 INRP has a long tradition of international contacts. It is the support institution to NESSE (European Network of Experts in the Social Sciences of Education and training). There are also regular contacts with Philadelphia-based CPRE (Consortium for Policy Research in Education) which unites seven leading American universities. Some twenty experts, scholars or officials from the USA, Australia, New Zealand, France, the United Kingdom, and other EU member states will contribute to debates. Discussions will focus on the implementation and support to accountability policies: what do they imply on how students and teachers are assessed and on the self-assessment of schools? What perspectives does the shift from the assessment of knowledge to the assessment for knowledge open to improve teaching practices? What are the effects of this regulation on the organization of schools, on responsibility-sharing between stakeholders including local authorities, parents, and students? What can we expect in terms of teacher professional development? What role can research play to make teaching more effective? This seminar is open to researchers, students, policymakers, administrative officials, unions, teachers, and students’ parents.